The Yankees on Thursday continued to build a powerhouse bullpen by reaching an agreement with righthander Adam Ottavino on a three-year, $27-million contract, a baseball source confirmed. The team did not announce the deal, which is pending a physical. Ottavino, 33, is a Manhattan native who grew up in Brooklyn as a Yankees fan, according to his mother, Eve, who said in a telephone interview that the family is thrilled to have Adam coming home. Yankees fans should be over the moon about their star-studded bullpen. Ottavino will join a group that features Aroldis Chapman, Dellin Betances and Zach Britton, all of whom have closer ability, and Chad Green. All have strikeout stuff. 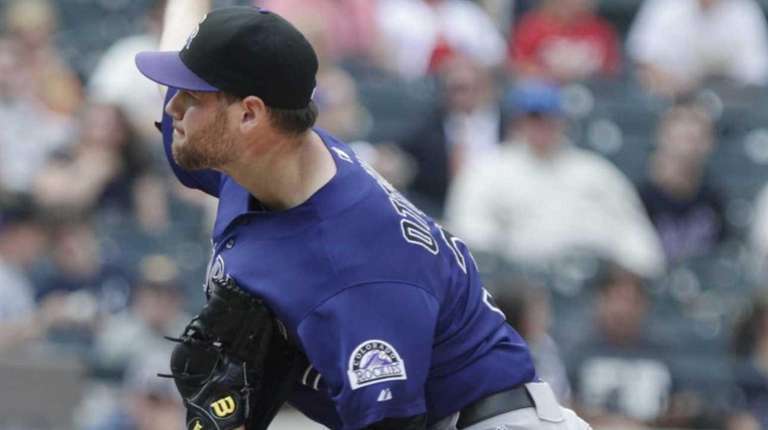 Ottavino, who throws a nasty slider, had a stellar year with the Rockies in 2018, going 6-4 with a 2.43 ERA, 112 strikeouts in 77 2/3 innings and six saves. 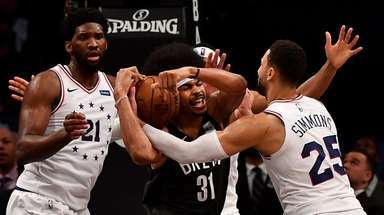 He appeared in 75 games. Betances will be a free agent and Chapman has an opt-out in his contract after the 2019 season, so adding Ottavino for three years gives the Yankees coverage should either or both leave. Ottavino also replaces David Robertson, who signed to be the Phillies’ closer. After breaking in with the Cardinals in 2010, Ottavino spent the last seven seasons with the Rockies. 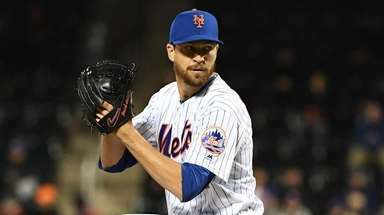 Overall, he is 17-20 with a 3.68 ERA and 17 saves in 363 relief appearances and three starts (all in 2010). The Yankees have question marks in their starting rotation even after adding James Paxton in a trade with the Mariners and re-signing J.A. Happ and CC Sabathia to go with Luis Severino and Masahiro Tanaka. The Yankees hope Ottavino and company will help them conquer the middle to late innings. 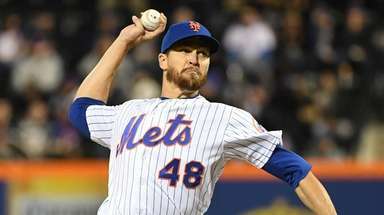 That was the formula that helped them win 100 games last season, although weak starting pitching helped lead to their four-game ouster by the eventual World Series champion Red Sox in the Division Series. So what’s next? 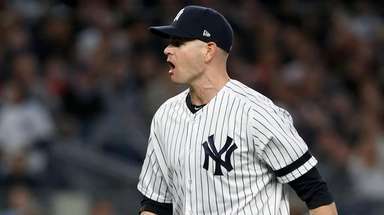 General manager Brian Cashman still is trying to trade Sonny Gray, and as long as Manny Machado and Bryce Harper are unsigned, the Yankees will always be thought of as a team that could lurk or pounce. 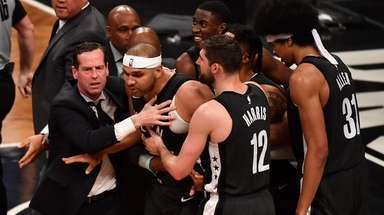 But the moves Cashman has made this offseason, including the signings of infielders Troy Tulowitzki and DJ LeMahieu, seem to indicate the Yankees are not going to swim in the deep Machado and Harper oceans. Eve Ottavino has been a fourth-grade teacher at P.S. 39 in Park Slope for the past 25 years. She said she didn’t tell anyone at the school of her son’s impending return to New York until the news started to break on the Internet on Thursday afternoon. Ottavino’s father, John, is a well-known actor who has appeared in movies, plays and on TV, including multiple episodes of the “Law & Order” franchise. Putting the ball in play won't be easy against the Yankees' bullpen, which added another strikeout pitcher in Adam Ottavino on Thursday. Aroldis Chapman, Dellin Betances, Ottavino and Chad Green totaled 414 strikeouts in 271 1/3 innings last season.